As I read the gruesome Stories written on the 1914-18 World war by N.Z. Soldiers I am sad because, although we knew that Dad was gassed in Belgium and became permanently disabled, we were not told and really had no idea of what he had been through during and after this War. Of course, we never thought to ask! If we had known I am sure we would have been full of admiration for what he had done and suffered and would have been more understanding as to why he was in poor health, and many other things, in our youth. These things are always realised when it’s too late! As the youngest family member I didn’t really know the exact details about Dad’s boyhood other than when growing up he helped on his father’s farm at Taikorea. (This family farm is still in the ownership of a Grandson and has attained Heritage status being owned by one family for over 100 years) Ira Wilson Mudford (known as Wilson) would walk 6 miles to attend school and joined the N.Z. Railways. 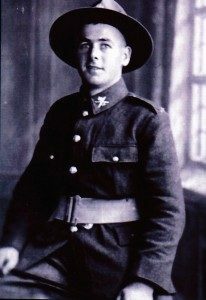 He was keenly interested in youth training as a young man and joined the Military Cadets (Territorials) in 1911, then moving in May 1913 to the Compulsory Military Training with the Wellington West Coast Regiment, where he attained the rank of Sergeant, until November 1916. When World War I broke out he was anxious to offer his services but the N.Z. Railways Department would not release him so he had to resign in order to volunteer for War Service. He joined the Specialty 23rd Reinforcements, N.Z. 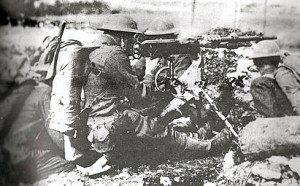 Machine Gunner Section and trained in the Featherston Camp. From there he marched over the Rimutukas to the Wellington Wharves to board the troopship “PAKEHA” which departed New Zealand on 26th April 1917. Their meals during the first 6 weeks were mainly rice, prunes, cheese, bread and jam, but during this time at sea most of the troops were sea-sick and vomited everywhere . They crossed the Tasman Sea, through the Bass Straight and Great Australian Bight until their first stop at Albany Western Australia, where they had land leave, rest and relaxation before continuing up across the Indian Ocean to Colombo, in Ceylon, where they again disembarked for leave before continuing on to Aden. They continued through the Red Sea and Suez Canal before entering into the Mediterranean Sea. At this stage of their journey all were suffering from fatigue, “Bed Bugs” and Lice which were impossible to get rid of. From here to England their troop ship were escorted by warships because of the risk of German submarines. He arrived at Devonport, England on 28th July 1917 and marched to “SLING CAMP in Bulford, Wiltshire where he was drafted to the 24th N.Z. Reinforcements, Machine Gun Section (The No.4 Coy N.Z.M.G.C.) This was the toughening up and training Camp for all N.Z. Soldiers. Sling Camp was 12 miles from Salisbury in the heart of Salisbury Plains. Weakened by the gas attack he suffered from influenza and trench feaver, frequently admitted to hospital and in December 1918 he was evacuated to the NZ general hospital in England. He was pronounced “ No longer physically fit for War service on account of illnesses contracted on active service” and on the 3rd May 1918 he embarked for New Zealand. The Hospital Ship “MAHENO” sailed via Panama Canal to arrive in New Zealand on the 14th June 1918. 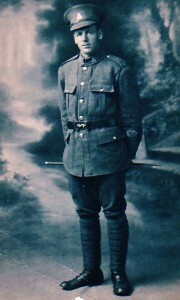 After more time in hospital he was discharged from the army on the 19th August 1918. Throughout this time Wilson was courting our mother and she kept in constant contact with Dad by letters and post cards while he was away overseas. He replied when he could by sending lovely post cards with short notes on the reverse. After his discharge he moved back to Foxton and lived, and helped, on the farm with our Maternal Grandparents and our Mother until their marriage in June 1919. In 1919, Ira purchased from his father a farm of about 101 acres in Taikorea after obtaining a Discharged Soldiers’ Settlement Loan. But by 1924, owing to continued ill health due to his war injuries he was forced to sell up the farm and its improvements, and enter Hospital. He was in Hospital continuously for two years when one of his lungs was permanently collapsed. In order to do this part of his left shoulder blade and parts of his ribs were removed. He was out of hospital for six months, and then for the following eight years he was in and out of hospital for further treatment and operations on account of lung trouble due to his war injury. His last operation was in 1934. By now they had a family of five children and the only income he received was his war pension. They acquired a house property in Foxton which was subject State Advances Mortgage. Despite his ill health Wilson did his best to provide for his family keeping a large vegetable garden providing garden produce and having fowls and a cow in an adjoining vacant section. Then came the Great depression of 1930 and the Second World War when they had the worry of their two oldest sons being overseas serving in the Royal New Zealand Navy and not knowing where they were or whether they were safe. Mum wrote letter cards or Aerographs to them every week, never failing, and looked anxiously for receiving any mail from them. Wilson contributed to the local community by serving on the Foxton Borough Council, the Wanganui Education Board and the Palmerston North Hospital Board, for many years. He stressed the importance of a good education and encouraged all his children to succeed. Wilson passed away in 1954 – he was only 59. I am interested in this account because my uncle, Alfred Ernest Nixon, was also a private in the New Zealand Machine Gun Corp, 4 Coy. He died of wounds on 7 April 1918 and is buried in Wimereux Communal Cemetery, Pas-de-Calais, France. On the Auckland Museum website entry for Alfred, there is an extract from a list of the personnel in the Machine Gun Corps. “Mudford, Ira Wilson” appears just above “Nixon, Alfred Ernest” (with only “Nelson, George” intervening). The details of Wilson’s training and travel given above match the details I have of Alfred’s training and travel. The 2 men must have known each other. I like to think that they shared some happy times before they faced the horrors of France. Perhaps somewhere there are some photos of Wilson with his comrades, one of whom just might be Alfred. In June 2016, my brothers Mervyn and Peter and one of my sisters, Mary, and I visited Alfred’s grave in Wimereux. Alfred died at only 27 and Wilson died at only 59; we acknowledged Alfred’s sacrifice by our visit and I acknowledge Wilson’s sacrifice by this note. A twist to the stories of the 2 men is that Alfred’s brother, my father Mervyn Nixon, went to Palmerston North in the 1950s. He taught at PNBHS for many years, possibly teaching some of Wilson’s descendants and perhaps even meeting Wilson himself through Wanganui Education Board activities. Fascinating. My grandfather was just ahead of yours … he went from Sling to Grantham in July 1917, and arrived at Camiers October 20th, posted to strength no.5 Coy on the 28th.